FILE - The U.S. Consulate in Benghazi is seen in flames during a protest by an armed group said to have been protesting a film being produced in the United States, Sept.11, 2012. The United States House of Representatives' Benghazi committee adopted a report Friday into the deadly, September 11, 2012 attacks on U.S. Consulate in Libya. The 800-page report found no wrongdoing by Hillary Clinton, who was secretary of state at the time and is now the presumptive 2016 Democratic presidential nominee, but revealed that she used an unapproved private email server for government business. The committee in which Republican lawmakers have the majority, voted 7-4 along party line to approve the report. Democratic lawmakers have submitted their own report into the 2012 attacks that killed U.S. Ambassador Chris Stevens and three other Americans. The committee's chairman, Trey Gowdy (R-South Carolina), indicated Friday a review process into possible evidence of perjury leaves open the possibility that Clinton or other witnesses could be further investigated. FBI Director James Comey testifies on Capitol Hill in Washington, July 7, 2016, before the House Oversight Committee to explain his agency's recommendation to not prosecute Hillary Clinton. The House committee inadvertently discovered Clinton's use of a personal email server in 2012. Clinton testified under oath last October that she never sent or received emails marked as classified through her private email server when she served as secretary of state. Clinton also said that she used only one mobile device for both government and private emails for “convenience,” and turned over all emails to the State Department. FBI Director James Comey testified to Congress on Tuesday that Clinton and her colleagues at the State Department were "extremely careless" in the handling of classified material they sent to each other via a private email server she established at her home in New York. Comey also said that Clinton used multiple devices for sending and receiving classified emails. 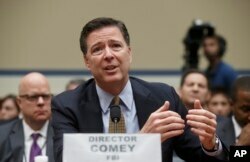 But Comey said that the FBI investigative team could not find evidence going through thousands of Clinton's emails that she "clearly, willfully" sought to violate U.S. laws and that "no reasonable prosecutor would bring such a case" against her based on the evidence uncovered during the probe. The House Oversight and Government Reform Committee called an emergency hearing Thursday where members questioned Comey for almost five hours about his recommendation to the Justice Department not to prosecute Clinton. Chairman Jason Chaffetz (R-Utah) told Comey that he would request the FBI investigate whether Clinton lied under oath to Congress. "You'll have one in the next few hours," Chaffetz said, after Comey told the chairman that a referral from Congress was needed to investigate Clinton's potential lying under oath. Comey defended his decision, saying that his team found no evidence that Clinton lied under oath to the FBI or broke the law by discussing classified information in an unclassified setting. Comey vigorously rejected Republican accusations that Clinton was given special treatment. To criminally charge Clinton based on the facts the FBI’s yearlong probe had found, would have been unwarranted and mere “celebrity-hunting,” he said. House Minority Leader Nancy Pelosi of Calif. speaks with reporters on Capitol Hill in Washington, July 7, 2016. 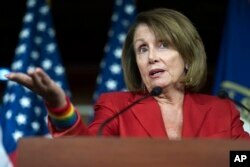 House Democratic leader Nancy Pelosi (D-California) dismissed the latest Republican move as purely political. Separately, the U.S. State Department is reopening an internal investigation into whether Clinton and her top aides mishandled classified information when she was serving as the secretary of state under President Barack Obama. "We will aim to be as expeditious as possible, but we will not put artificial deadlines on the process," State Department spokesman John Kirby said Thursday, noting that the internal review can proceed now that the Justice Department investigation wrapped up with no charges filed against Clinton. The move came a day after Attorney General Loretta Lynch agreed with the FBI recommendation that no criminal charges should be filed in relation to the email case.